BBC NEWS | UK | Magazine | The most talked about economic conference ever? The most talked about economic conference ever? There was a time when an economic conference would be covered mainly in the financial pages, and snoozed through by the rest of the world. 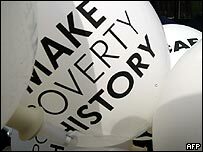 But with the Make Poverty History campaign putting the G8 summit in the mainstream, and with blogs making everyone a potential world trade expert, it's going to be more interesting this time. "The rich countries can pay to fight Malaria and AIDS and to provide clean water. They can cancel debt. This is easy because all it costs is money. The hard part is to let the goods of developing countries compete in our markets and to let them win market niches where they can, even at cost to our own producers. This will not be on the agenda at G8 or Live 8. It should be." Meanwhile, the combined forces of anti-poverty campaigners and the entertainment industry have put the possibilities of the G8 summit in many more minds. The intermingling of themes of poverty, arms, despotism, banks and trade gives a host of entry points to the questions on the Gleneagles agenda. "The diplomatic relationship between the UK and the US since 1939 has been one where the United States had consistently screwed the British over - WWII debts, the Suez and crippling our economy, dumping sterling on Black Wednesday, the Falklands, and the list goes on. Yet when America needs an ally (Iraq twice, Afghanistan), Britain is first to the call." As usual, the libertarians at Samizdata take a different approach, trying to shout above "the din of idiotarian drum banging" to emphasise the role played by corrupt African states and arguing for removal of African government for solving African problems, and showcasing a provocative poster from the anti-statists Bureaucrash which features a starving child with the slogan "Socialism Kills - Free Markets Feed". More locally, Freedom and Whisky gives some anecdotal evidence from Scottish policemen that any protests at Gleneagles might become part of the ID card debate (see also previous Weblog Watch). Outside of political comment, you can, if you so wish, keep up with personal blogs looking forward to the Live 8 day of partying, or campaigners planning cycle rides. And for pure silliness, The Snakehead goes off on a mucky reverie based on Brad Pitt's e-mails supporting the ONE Campaign. Of course, it's not just Western blogs which have something to say. The combination of G8 and Live 8 provides the best chance yet for some links to the previously separate African blogosphere. Sapphire Excel is chiefly a linkblog with a good digest of African news and, since it's a big continent to say the least, there are more localised blogs such as Footnotes From The Ugandan Underground and Darfur's The Passion Of The Present. As you might expect, the context for debate is likewise staggeringly broad, with oil a recurrent theme: Prayas Abhinav ponders the effect Shell has had on Africa, a theme which recurs in African Oil Politics. In fact, if you want to bone up on specific issues, from African IT through African water to African crises, the "Afro-blogosphere" (apologies for the coinage) may be your best starting point. Kenya has vibrant online coverage. Two of the liveliest are Kenyan Pundit and The Thinker's Room. The former is one of Harvard Law School's innovative collection of blogs featuring lectures and podcasts, while the latter is the writings of a kind of Kenyan Hilaire Belloc with a natty line in political satire, such as his Anatomy Of A Kenyan MP. "Bob Geldof lets out the strange mix of profanity and plea making that has become his signature tune. Whenever I catch these so called Africa saviours on TV, the urgency of their appeals and the faux concern they exude always leaves me enraged. They use African poverty and suffering like a prop for already over-large egos. We are helpless beings who cannot survive without the concern of an Elton John (in the background) or a Geldof who has not written a hit song in a decade and yet can save Africa." "The population of Edinburgh is well under 500,000. Geldof wants to somehow magically triple the city's capacity for a day out. And now that Geldof has made this ridiculous plea... the centre of attention is not now poverty in Africa but whether or not Edinburgh can safely hold a million people. Well done Bob!" The pithiest comment, though, has come from the music bloggers. New York London Paris Munich is sceptical that the no-pop line-up is as populist as the organisers claim, while the funniest pop blog, No Rock & Roll Fun has been posting relentlessly, covering such topics as the absence of black artists, Gordon Brown's wish to see the Spice Girls at the concert, Bono's relationship with the Popes, Status Quo's claim to be unable to remember Live Aid and the profits being made by phone companies. So it's all a long way from and a lot more diffuse than the good feeling around Band Aid. Bob Geldof himself has been a guest of blogger and web elder Joe Trippi, but the agenda is still wide open in the blogosphere, and should get more lively as 6 July nears.